Majestically perched on one of the hills of the breathtaking Valdichiana is the medieval and Renaissance town of Montepulciano, well-known for its fabulous wine. 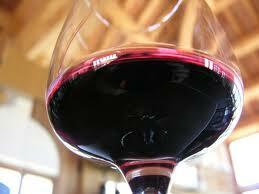 Its Vino Nobile is considered by wine connoisseurs among the best Italian wines. 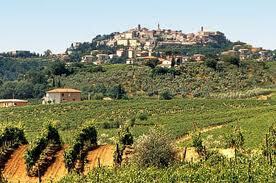 Tuscany Holiday Rent offers a wide selection of holiday accommodations in the Valdichiana. 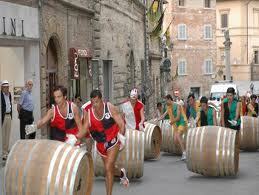 Well, from Friday 19th August until Sunday 28th Montepulciano is going to be rolling its wine casks around town! Precisely tomorrow is starting the Bravio delle Botti, that is the Cask Banner, a traditional challenge, which each year sees the 8 quarters of town (Cagnano, Collazzi, Le Coste, Gracciano, Poggiolo, San Donato, Talosa and Voltaia) compete for the conquest of the Bravium, the magnificent painted banner with the iconographic image of the patron Saint of town, St. John the Beheaded. 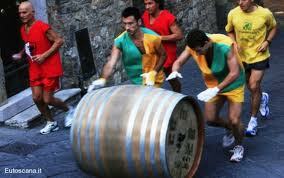 The competition itself consists in rolling up hill a 80kg cask! The two athletes (how else can we call them?) pushing the cask are unambiguously called ‘pushers’ and have to cover the main streets of the historical centre of town until arriving in the main square in front of the Cathedral. Actually the race itself only takes place on Sunday 28th, but Montepulciano has many events in store for the many visitors arriving in this period of the year. Tomorrow the town starts with “Cantine in Piazza”, in other words Cellars in the Square, with wine tasting organized by the Consorzio del Vino Nobile right in the Cathedral Square. Saturday proceeds with the beginning of the celebrations. Flag-wavers, drummers and a historical pageant will wind along the streets of Montepulciano until the top where the Gonfaloniere, a highly prestigious communal post in medieval and Renaissance Italy, will make his speech. On Sunday 21st the flag-wavers and drummers will again go along the roads for the presentation of the banner. The afternoon concludes with the gourmet cuisine prize giving of “Dinner with Nobile”. From Sunday to Friday 26th visitors will be able to observe the various evening trials of the ‘pushers’ and each of the eight quarters will hold their propitiatory dinners. On Thursday the 25th the historic centre will see the pageant of the Candle Procession in the striking atmosphere of the town streets only lit by tapers and torches. Obviously the flag-wavers and drummers will be joining up! 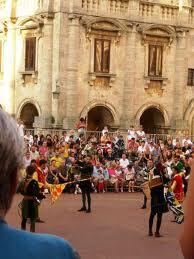 As forewarned the Cask race is on Sunday 28th and concludes, needless to say, with flag-waving and drumming. Ten days of fun, events and wine in one of the most beautiful towns of Tuscany. Questa voce è stata pubblicata in Culture and accommodations in Tuscany, Festivals and feasts in Tuscany, Tuscan food and wine. Contrassegna il permalink.